VAT AND BARREL Brendan Moylan and Tim Welch at Stillwater Spirits in Petaluma. Perhaps it was inevitable in the land of hop-laden beers. But a recent rise in spirits that incorporate brewing's main bittering elements not only highlights the surging interest in craft beer, but also serves as an inlet to better understanding the hidden overlaps between the worlds of brewing and distillation. From Charbay Winery & Distillery's recently released hop-flavored whiskeys, to the upcoming "beer schnapps" from Stillwater Spirits and Moylan's Distilling Company, microdistilleries in the North Bay find themselves at the very forefront of distillers embracing the citrusy, piney and herbaceous contributions of hops. Marko Karakasevic, the master distiller at Charbay in St. Helena, comes from a long line of artisanal distillers and began learning the craft from his father at an early age. It was a shared interest in both distilling and homebrewing that piqued his curiosity about what would result from combining the two. "I obviously knew wine distilled into brandy," recalls Karakasevic, "because I was distilling that with my dad already, and I was brewing beer, and I was learning more and more that whiskey is distilled from those same grains and malts that I was using to make my beer. Except I was adding killer hops, like Chinook, Cascade, Nugget, Eroica. "And so I was, like, well, what's the difference between using (so to speak) a 'distiller's beer' or wash or any term you give it [the fermented, often beer-strength precursor that ultimately gets distilled in making spirits] versus a bottle-ready beer that's got alcohol in it. I mean, if it's got alcohol in it, you can distill it. And I'm not really afraid of trying to distill anything." Karakasevic's first commercial effort in distilling beer started back in 1999, when he and his father crafted 24 barrels of hopped whiskey from a (now-defunct) local brewery's Pilsner. Of those barrels, only seven have so far been bottled, with an additional small offering (Release III) planned for early next year. While the hefty anticipated price tag ($450) guarantees that I will be looking elsewhere for stocking stuffers next year, this first production serves to highlight the vastly different time frames between making finished beer (often two to three weeks) and distilling a polished whiskey. Thirteen years or so along, they've still only released one-third of the batch. More recently, Charbay partnered up with Healdsburg's Bear Republic Brewing Co. to create a series of double-distilled, hop-flavored whiskeys. "I went to them because, first of all, I love their beer," says Karakasevic, "and second of all, they can produce a tanker for me." Having an adequate supply of wash (or its finished beer equivalent) is important, especially when the distilling processes winnow the final product down to about one-tenth its original volume. 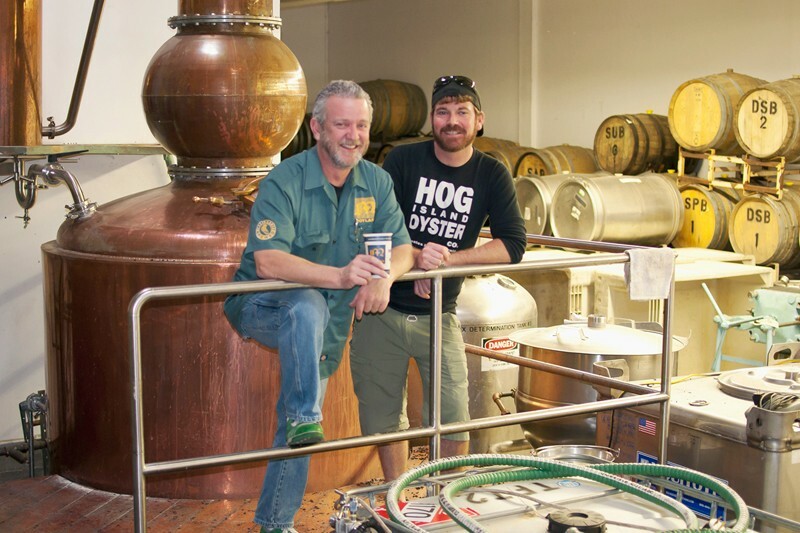 In creating their pair of "R5" whiskeys from Bear Republic's Racer 5 IPA, a 6,000-gallon tanker of beer ultimately produced about 590 gallons of distillate. That concentrated result was then aged in either stainless steel ("clear") or French oak ("aged") over a period of 22 months. Both versions were released in August of this year, and I received a small sample bottle of each for review. Neither their R5 Clear Whiskey ($52) nor the R5 Aged Whiskey ($75) showed anything out of the ordinary hop-wise in the aroma (the volatile hop aromatics just boil off), but hop-derived flavors approximating citrusy pith and hints of pine came through quite clearly from those first sips forward. The clear version was a better showcase for the hops' contribution, while the aged rendition seemed softer on the approach, with additional wood sugars and toasted barrel notes throughout. Adding a drop of water opened things up in both, while an ice cube unveiled the malt underpinnings.